This way of studying history seemed extremely ridiculous. But the method pursued by myself and several others in beginning algebra at about the same time was not greatly superior. Our text-book contained several long sets of problems which were the terror of the class, and scarcely one of which we were able to solve alone. We had several friends, however, who could solve them, and, by calling upon them for help, we obtained the "statement" for each one. All these statements I memorized, and in that way I was able to "pass off" the subject. A few years later, when a school principal, I had a fifteen-year-old boy in my school who was intolerably lazy. His ambition was temporarily aroused, however, when he bought a new book and began the study of history. He happened to be the first one called upon, in the first recitation, and he started off finely. But soon he stopped, in the middle of a sentence, and sat down. When I asked him what was the matter, he simply replied that that was as far as he had got. Then, on glancing at the book, I saw that he had been reproducing the text verbatim, and the last word that he had uttered was the last word on the first page. These few examples suggest the extremes to which young people may go in their methods of study. The first instance might illustrate the muscular method of learning history; the second, the memoriter method of reasoning in mathematics. I have never been able to imagine how the boy, in the third case, went about his task; hence, I can suggest no name for his method. While these methods of study are ridiculous, I am not at all sure that they are in a high degree exceptional. The most extensive investigation of this subject has been made by Dr. Lida B. Earhart,[Footnote: Systematic Study in the Elementary Schools. 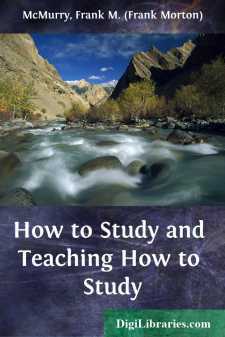 A popular form of this thesis, entitled Teaching Children to Study, is published in the Riverside Educational Monographs.] and the facts that she has collected reveal a woeful ignorance of the whole subject of study.